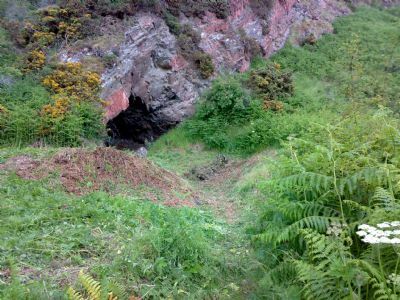 A Ross-shire doctor, Dr William MacLean, excavated a “cave near Rosemarkie” from 1907-12. He found many pieces of worked bone, mainly fairly basic pins and awls. One pin was much better finished and originally had five inset pieces of amber, three of which remain in situ. 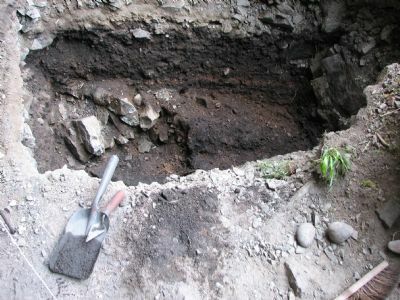 No excavation notes appear to have survived when his widow later presented his finds to the National Museums of Scotland. 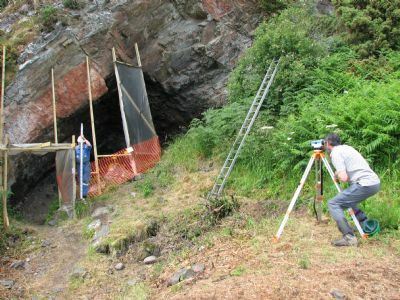 The Rosemarkie Caves Project was set up to research the archaeology of the caves on the coast between Rosemarkie and the Cromarty Firth and their first major field project was to excavate Cairds’ Cave, the nearest cave to Rosemarkie, and traditionally said to be the site of Dr Maclean’s excavations 100 years ago. 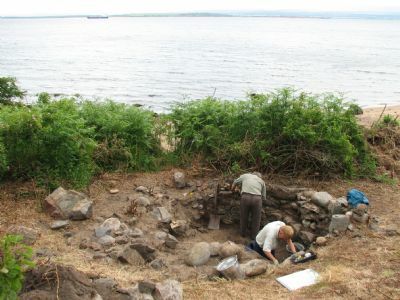 The excavation took place from 21st June to 2nd July, 2010. The excavation leader was a professional archaeologist and the work was conducted by volunteers, mostly experienced amateurs. 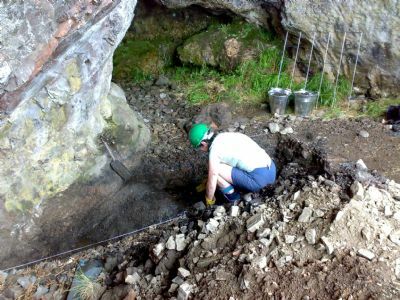 There were 3 principal activities: Excavation of the floor inside the cave, excavation of walls and midden at the entrance and wet-sieving soil samples. 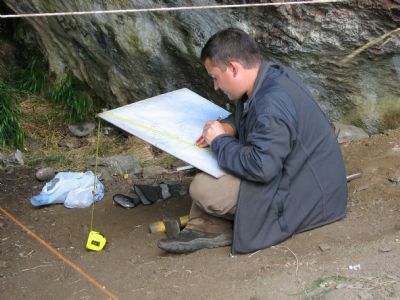 Radiocarbon dates from bone fragments found both by Dr MacLean and in situ in the recent excavation have revealed the base of the cave to date back to 300BC, while the bones removed by Dr MacLean date back to 600/700AD. 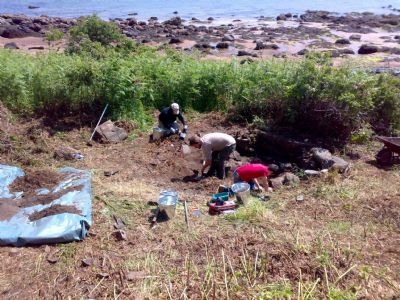 A full report on the project and post-excavation results can be requested by contacting the Rosemarkie Caves Project. An interim report can be read here. June 16th, 2010. 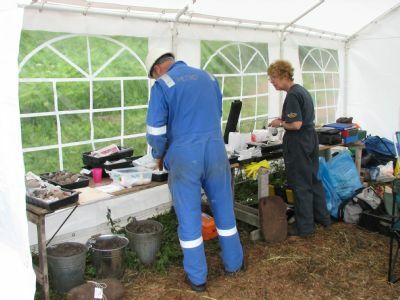 Hugo Anderson-Whymark appointed as Excavation Leader and we are in the last stages of gathering equipment for our start on Monday, 21st June. June 23rd, 2010. Excavation been underway for 3 days. 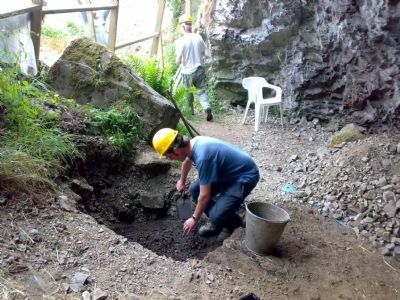 Trench 1 started at the back of the cave, with spoil being wet-sieved. 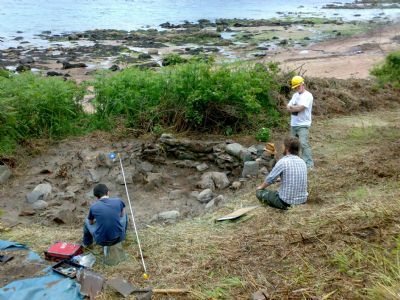 Trench 2 is at the cave entrance, Trench 3 cuts into both spoil heaps outside the cave and Trench 4 is inside the remains of a stone building between the spoil heap and the beach. Trench 1 has revealed large numbers of winkle and limpet shells, these are also present in Trench 3, along with some pottery and glass. 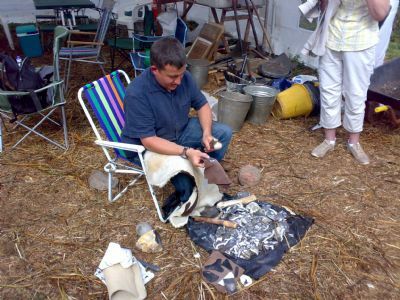 June 27th, we have an open afternoon with Hugo demonstrating flint knapping. 2nd July, we finish 2 days early. 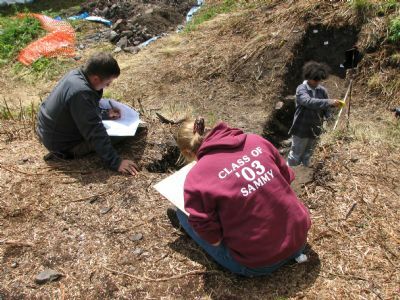 We have accomplished as much as we can without extensive further excavation. 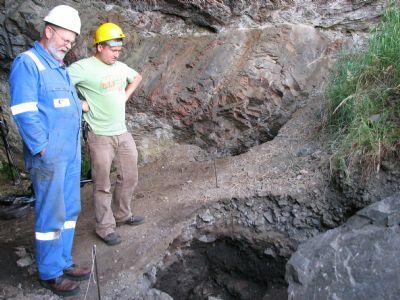 Vegetation cleared back to reveal the size and extent of the features outside the cave. The cave looks a bit more impressive now too ! 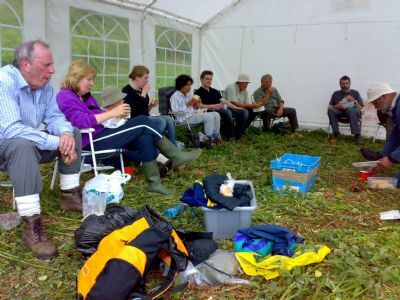 A well earned lunch break ! Progress in Trench 1, which proved surprisingly wet. Trench 3 - what the wise men saw from on high. 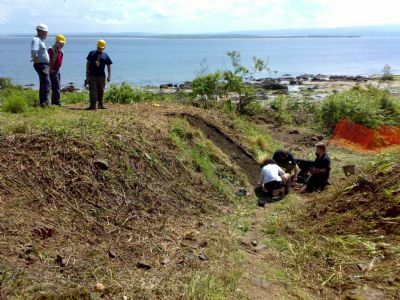 Early days for this trench designed to investigate the structure and content of what are assumed to be Dr MacLean's spoil heaps. 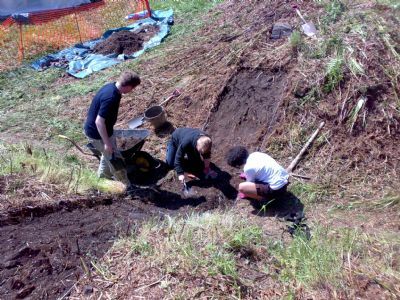 Trench 4 - investigating a stone built structure uncovered by the site clearance on Day 1. 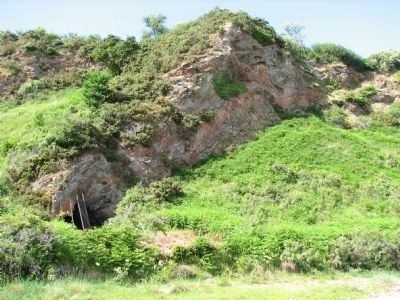 This structure, between the beach and MacLean's large spoil heap, had been mentioned in earlier records of the site. Trench 1 - down to bed rock and being cleaned up for photography. Nearer the front of the cave Trench 2 has been opened, hoping to find the edge of Dr MacLean's excavations. The structure in Trench 4 being planned - after a deep discussion that is. 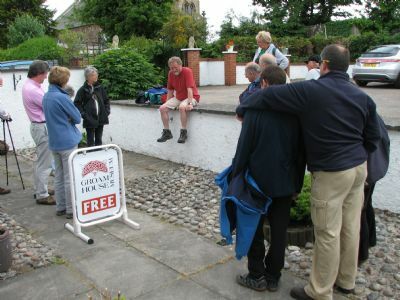 At Groam House Museum local guide Bill Taylor gathers together the first party for a guided walk to the cave. 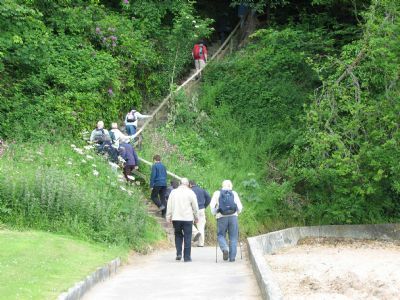 Bill definitely in the lead as the party takes the steps up to the coastal path. 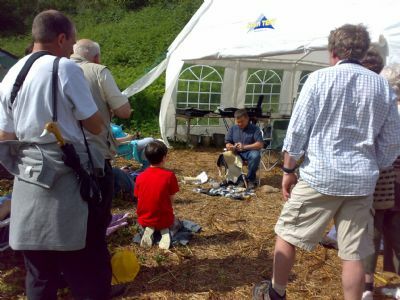 After the third guided walk Hugo treats the guests to a demonstration of flintknapping. 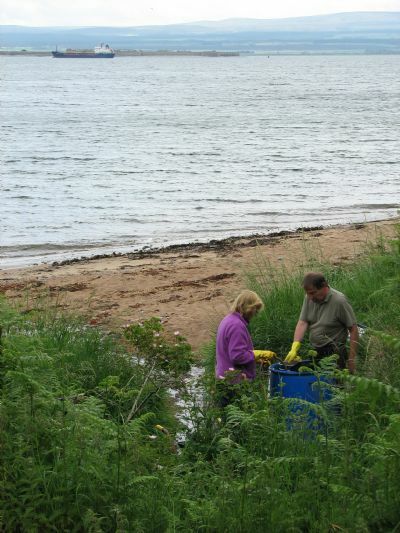 Wet sieving continues, Fort George and local shipping providing a scenic backdrop. 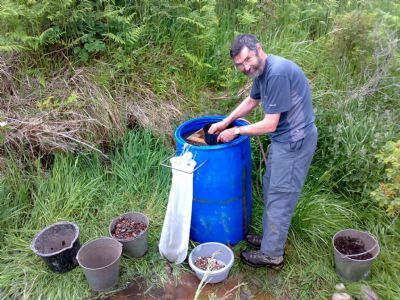 Finds and samples processing is now in full swing. 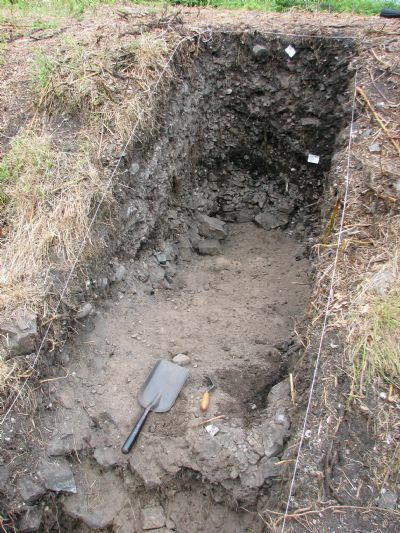 In Trench 4 the enigmatic structure is further revealed. A deserted Trench 3 - it must be lunchtime ! Down to natural now with some nice tip lines in the section. With rocks in the bottom everything is upside down - certainly looks like Dr MacLean's spoil heap. Trench 2 is equally deserted. Some nice stratigraphy emerging in the section. In situ deposits at last. Jonie goes happily back to the drawing board. Planning is tricky with such variations in surface level across the site. 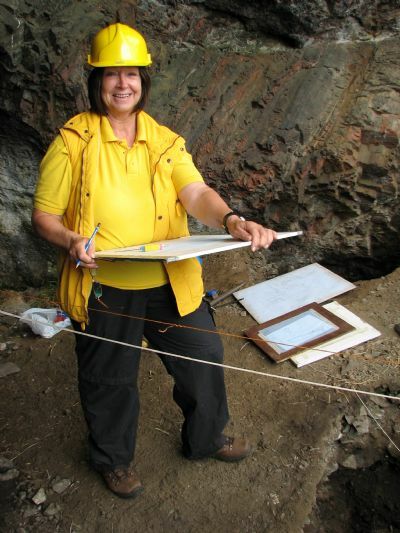 Levelling in a permanent local datum, starting here from the site datum just outside the cave. 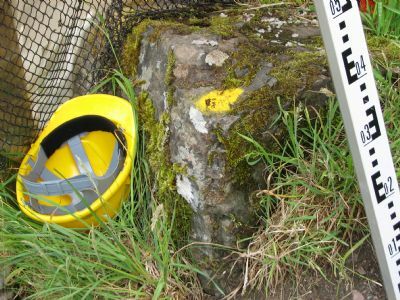 That was itself levelled in from an Ordnance Survey benchmark in Rosemarkie village - quite a feat of surveying kindly undertaken by Richard and Jonie Guest. 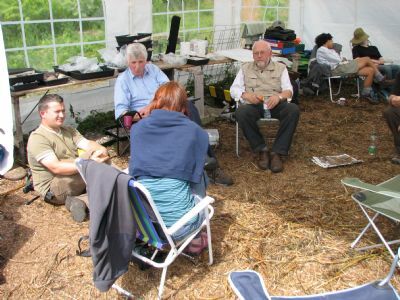 With excavation of the trenches largely complete the emphasis outdoors switches to the recording of sections. Excavation still life around the site datum. Hugo demonstrating advanced ruler control as the recording blitz continues. Soon we will have to leave the superb coastal views behind. The excavations were very fortunate with the weather, mainly warm and dry. 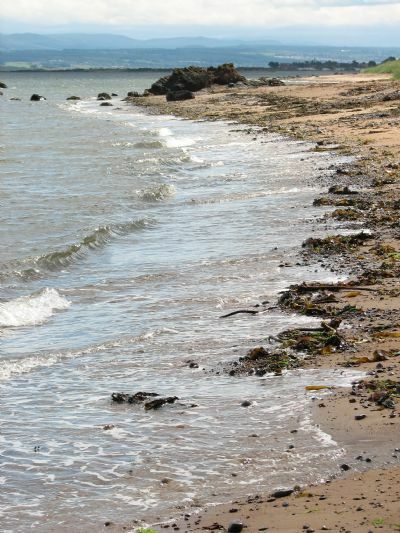 This view looks down the beach towards Inverness. The noise of the waves breaking on the beach did sometimes make communications on site quite difficult. A final look back at the cave with Scart Craig towering above it. A family of peregrine falcons were regular visitors to the clifftop during our stay which was a treat for the nature lovers amongst us.